It's already October, the 10th month of the year. My 2 older brothers, my sister-in-law, my cousins and an uncle are celebrating their birthdays this month. I'm also thinking of Halloween every time this month arrives. When Chloe was in pre-school, she enjoyed celebrating Halloween with her teachers and classmates. Now, I don't know what's in store at their school. They didn't say anything. All I know is that they are to celebrate United Nations Day on the 24th. Talking about Halloween, I was too surprised to see Chloe's English test result. 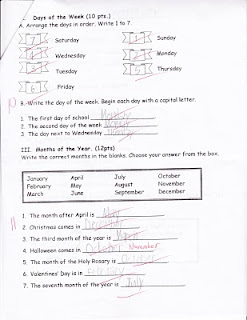 Her teacher marked her answer wrong to think it was right. The question was: "Halloween comes in______" wherein she would write the correct month. 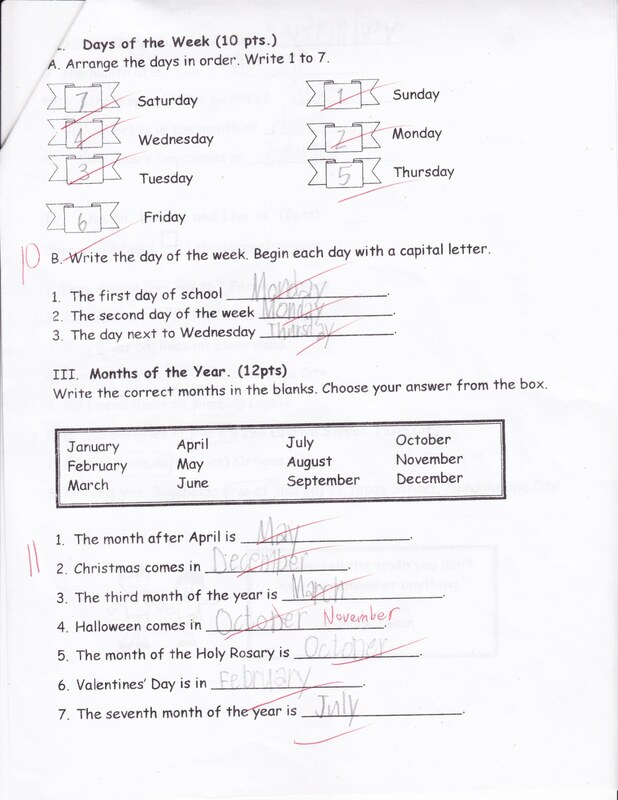 Chloe answered October and her teacher crossed it out and put her own answer which was November. Huh? Perhaps it was an honest mistake but I won't let this escape her. Chloe could've gotten perfect but because of that, she got 1 mistake. Hey, 1 mistake is okay with me, it's a great score already! But giving the students the wrong answer is not okay with me. Her teacher needs to be corrected. Being the stage mother as I am (^_^), I wrote her English teacher a letter instead (since I cannot go to Chloe's school easily as I used to because of the baby). I requested politely to review my daughter's paper and at the same time, corrected the error she made. I also attached the researched I made on the internet. And for your information, that was the 2nd time I wrote her a letter because she also marked Chloe's answer wrong in her book even though it was correct. I know we are just humans bound to commit mistakes but sometimes, we should be extra careful especially if we are teachers in a school known for its good reputation. If the teacher they hire is not always careful, then their reputation might be marred just because of ones carelessness. ya, sometimes teachers need to be corrected too..
Halloween is a wildcard frivolous, wild, hot and not serious. Halloween allows you to anyone but yourself, do things you never otherwise. As a costume that is as unlike the reality as you can.